Google Drive is supposed to be the service that stores all your files and lets you access them from any device. It's supposed to be, but it's not. There are other Google services that are better suited for storing some of your files: Google+ Photos for storing photos, YouTube for sharing videos, Google Play Music for uploading music. 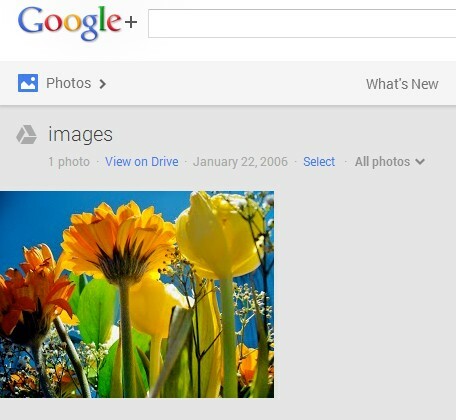 If you happen to store photos and videos in Google Drive, you can now add them to Google+ Photos. Just visit this page and click "Show Drive photos in Google+". Click the "albums" section and you'll see some albums with a Google Drive icon: they're from Google Drive. For some reason, Google+ displayed only a few of my Google Drive photos and videos, not all of them. 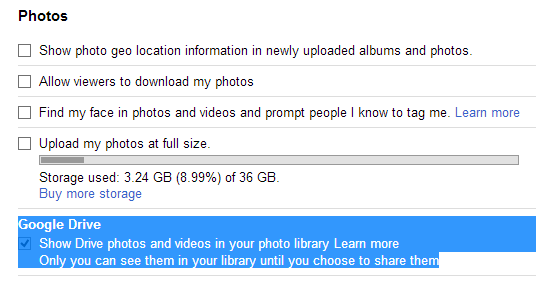 "If you store photos in your Google Drive, you can also choose to view each folder as an album in Google+. Only you will be able to see them in your library until you choose to share them. If you have Auto Awesome or Auto Enhance turned on, then those features will be applied to your photo album but your original drive files will remain intact. After you enable the feature, folders containing JPG, GIF, WebP, RAW or video files will be viewable from your Google+ photo library and each Drive folder will become a different album marked with the Google Drive icon. Only you will be able to see them in your library until you choose to share them." explains Google. To enable or disable this feature, you can go to the Google+ settings page, find the Photos section and check or uncheck "Show Drive photos in your photo library". To remove a Drive album from Google, open the album in Google, click the drop-down next to "Share" and then click "remove album" (the album will only be removed from Google+, not from Google Drive). There are many limitations: "This feature is not available for Google Apps accounts. Screenshots, icons, thumbnails, and other images may not be viewable using this feature. You cannot tag, +1, edit, or comment on Drive photos. To enable these features, share the photo first. Sharing a photo will create and post a copy of the photo - your original Drive photo will remain intact and your circles will not gain access to your Drive." I don't think that the new feature is a good idea. Why not store all your photos in Google Drive and use Google+ Photos as an application that can manage photos and display them in interesting ways? 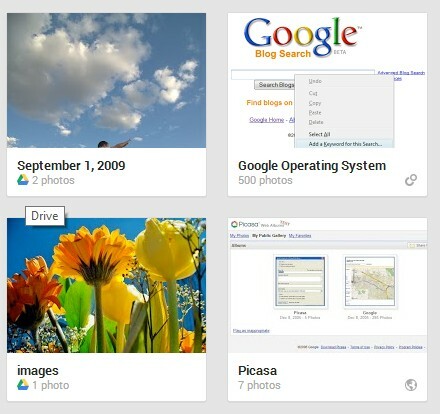 This way, you would no longer have to deal with the old Picasa Web limitations (1000 photos/album, limited sharing, no sub-albums) and you could access all your photos in both Google Drive and Google+ Photos.